Gami Chicken & Beer, Little Lonsdale St, Melbourne CBD - my name is Food. Gami Chicken and Beer has a few locations scattered in Melbourne CBD, we wanted to go somewhere close to where we were so we went to the Little Lonsdale St Branch, however we kind of got lost and went the opposite direction and since it was hard finding the numbers on the buildings, we actually ended up having to make a u-turn and walk back to the other side, Little Lonsdale St was quite a long road. So, this chicken better be good we thought, since we even wanted to go somewhere else since we couldn't be bothered walking back and far.. but in the end, we thought, who cares, just give it a go, and definitely... no regrets. They say that Gami Chicken was born from unique flavours of 7 different herbs and spices, balancing the crispiness and moistness, also the richness of the chicken. 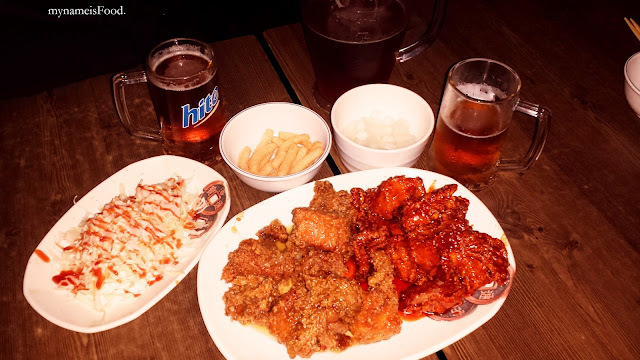 When we sat down, we ordered a 'Jug of Beer' (1140ml: $14.5) and was served with a simple banchan (Side Dishes) of only two. At first we thought, oh? Only two? Shrimp crackers, the ones you could get from your local Supermarkets or Korean Mart and also cubed radish in the other bowl. You are allowed to ask for free refills which is always nice in Korean restaurants. 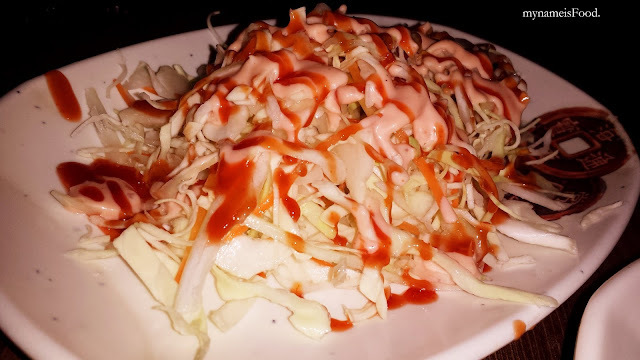 Cabbage salad was also given along with the chicken we ordered. A simple shredded cabbage salad with shredded carrots, mayo and tomato sauce drizzled on top. As for the Chicken, you have a choice of Gami Original Whole Chicken or Gami Boneless Chicken and since he always preferred his boneless while I actually don't mind having to eat it like KFC, we ordered the 'Gami Boneless Chicken' (Original/Flavoured: $34) where you can choose your own flavour in which you could have either one flavour or a Half & Half flavour for the chicken. The Boneless Chicken states that it does have a mixture of both breast and thigh fillet, 750g for the lot. We chose Soy Garlic and Spicy, the other two choices were Original Fried and Sweet Chilli. The Soy Garlic, had a distinct flavour of the soy but not so much the garlic. It would have been nice to have a stronger flavour of the garlic, however, the chicken skin seemed to be crispier due to the glaze of it but it was rather oily at the bottom, or maybe that was just the soy sauce melting underneath. As for the Spicy, I was quite scared if it would be too spicy for me since I'm not a spicy eater as much. However, I quite enjoyed it. It had the classic Go-Chu-Jang flavoured but also not as strong as killing the taste of everything or making your lips go numb. 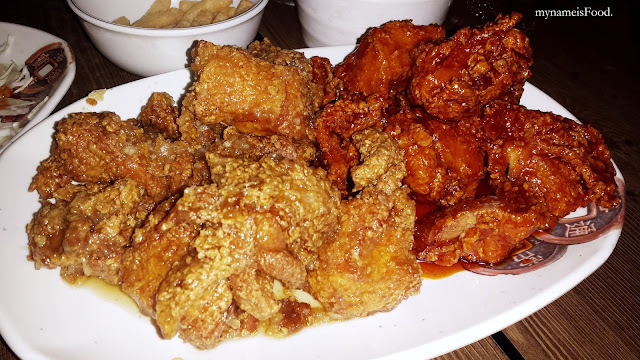 Both chickens were juicy, moist and also flavoursome and the good thing about it was that you could see the chunks of meat, real meat I must say and a not too thick batter which is always definitely a winner when it comes to Fried Chicken. Sadly, it's hard to find Korean Fried Chicken the way Gami does it in Brissie. Still on the hunt though, or if not, I guess we'll just have to go back to Melbourne for it..